Centered around an all-black theme for Halloween, the Aggie Nights Primeknit alternate uniform features Texas A&M’s “Lone Star Logo” clear-coated seamlessly into the black satin finish of a HydroSkin ® helmet from Hydro Graphics Inc. (HGI). This innovative helmet features all-new reflective technology to light up the night. The black jersey and pants are highlighted with silver metallic numbers and stripes with carbon-fiber detailing, while the “Texas A&M” moniker is featured in metallic maroon lettering with carbon-fiber detailing across the chest. Additionally, the Lone Star Logo is also incorporated into the pant stripes, creating a cohesive signature look. More pictures at their site. The Diamondbacks will be wearing a Randy Johnson patch on their hats today. Phil with a great shot of the original Expos uniforms. Nice catch here. What’s this about? Here are some photos of the Nuggets new unis. I love that Expos picture. Bleh… The A&M uniforms are just more of the boring same… BLACK. Now that’s an original idea. Give me a break! When will someone introduce a damn good uniform change??? Seems like its been forever. I don’t understand A&M wearing the black. It’s not their color. Is it for Halloween? Ok,I didn’t know college kids needed that kind of coddling but ok. They should wear orange too. Idiots. Maybe wear some vampire teeth too. A&M had perfect uniforms. Before this current garbage. Stupid font. Stupid unnecessary stripes. So… are they going to be playing an orange team on Halloween? If so, cool. If not… then this is stupid. Ok, so I re-read everything… and they’re not playing an orange team. So… yeah. Stupid. The Brewers played San Diego Thursday and had no local broadcast. The San Diego feed was used in-house. Maybe that had something to do with it. 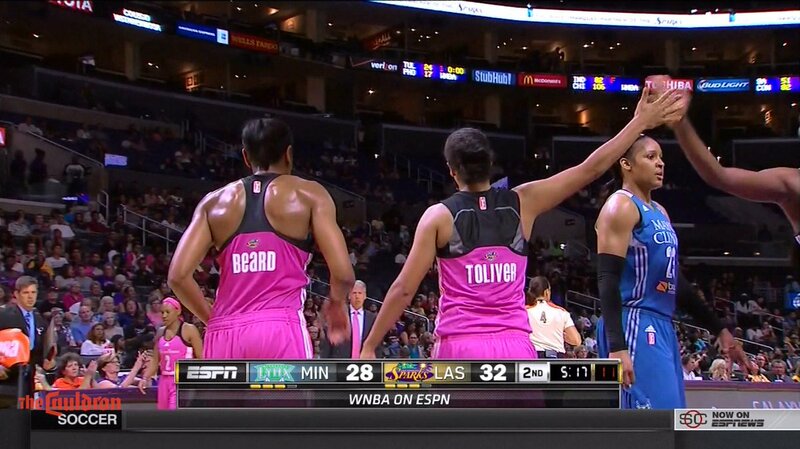 The WNBA ends its week for Breast Cancer Awareness on Sunday. In the middle of the week, the L.A. Sparks wore a special pink uniform that had an extreme “racer back” design that was too small to allow the uniform number to be displayed. I guess that’s a new category: ONOB .. “Only Name On Back”? That’s just poor design. They could have moved the player name down a bit and had room for numbers. They had plenty of room for numbers, just not both name and numbers. Why not just go NNOB? ADIDAS needs to stop making FOOTBALL UNIFORMS period! They make good football kits…. Between the Expos pic today, and the logo analysis yesterday, I couldn’t be happier. Well, the A&M uniforms are just more of the boring same… BLACK. Now that’s an original idea. Give me a break! When will someone introduce a damn good uniform change??? Seems like its been forever. The A&M uniforms are just more of the boring same… BLACK. Now that’s an original idea. Give me a break! When will someone introduce a damn good uniform change??? Seems like its been forever. Are the sizes of the letters on the Nuggets NOB bigger than the league-mandated 2-1/2 inch (IMO ugly) size? I wish they would go back to the 3 inches.